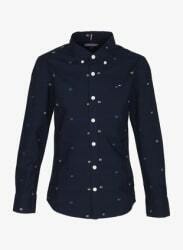 Add a dash of vibrant hues to your boys wardrobe with this navy blue coloured casual shirt from Tommy Hilfiger. Made from cotton, this casual shirt will ensure a comfortable fit. Featuring printed, this casual shirt will look best when teamed with jeans and sneakers.